Willy Simon’s excellent article on the plight of pedestrians in Dublin didn’t mention one of the most effective tools in making life easier for the average biped: zebra crossings. Their non-appearance in Simon’s article is not surprising. There is, I think, only a single zebra crossing in the whole of Dublin today – in the Italian Quarter. Yet, they are ubiquitous in many European cities and provide a simple and effective way to get across the road. They are also fairly common in other Irish cities and towns, so they’re not an alien concept for us. So why can’t we have more of them in Dublin? They are both low-tech and civilised. The idea is that the pedestrian walks up to the black-and-white crossing point and keeps on walking to the other side of the road. Other traffic must give priority to the pedestrians. For the pedestrian, there are no buttons to push or traffic lights to wait for. Zebra crossings seem to have been introduced in Britain sixty years ago and are found in many European countries. In the United States, they’re known as crosswalks and are remarkably effective for such an allegedly car-obsessed country. I’ve lived in Washington DC, and I now live in Brussels. Both cities have reputations for being car-centric but, in both places, zebra crossings are everywhere and are almost universally respected. It seems, though, that they are being quietly phased out in Britain, and the same is surely true in Ireland. You still see them in many country towns, but I suspect that they’re no longer the road engineer’s first choice. And they are almost entirely absent in Dublin. This is a shame. The zebra crossing is perfectly suited for Dublin’s jostling city centre. 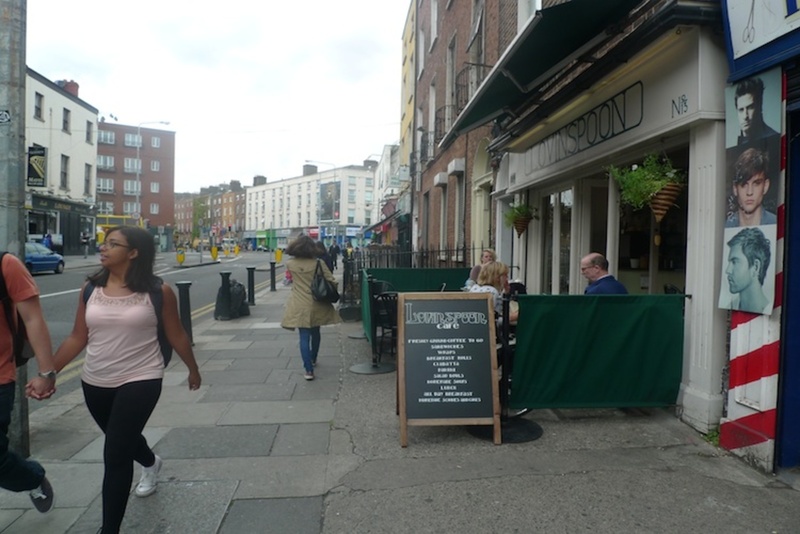 Pedestrians vastly outnumber cars in Dame Street, College Green, St Stephen’s Green and their environs, but the arrangements for pedestrians, as Simon points out, are woefully inadequate. Pedestrians wait with understandable impatience at the standard “pelican” (automated) crossings until the little green man signals that they have brief permission to cross the public road. The crossing times are as measly as mere seconds in the minute, and you have to cross three of these to cross College Green. It is no wonder that many Dublin pedestrians refuse to follow the rules, and thread their way through the gridlocked traffic as best they can. The zebra crossing, by contrast, gives pedestrians priority at all times. With zebra crossings, cars wouldn’t barrel through junctions. They would, instead, nose through the natural gaps in the flow of pedestrians. For their part, pedestrians would be less likely to jaywalk mid-street, because there would always be a safe crossing spot nearby. Zebra crossings would also remind drivers that they don’t have the right of way over pedestrians when they turn into side streets. 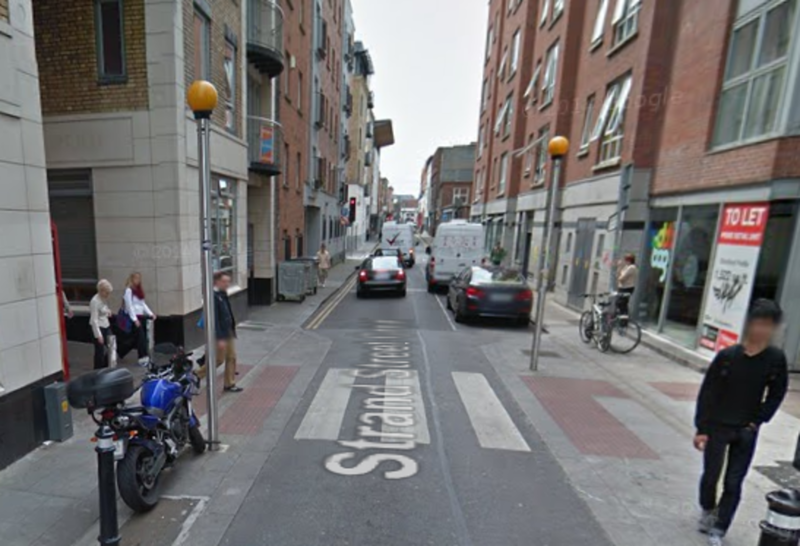 Would zebra crossings create even more traffic congestion in Dublin? I don’t think so. Traffic moves through Dublin very slowly anyway; average journey speeds slowed from 17km/hour in 1994 to less than 12km/hour in 2002 due to traffic congestion, barely faster than a horse and carriage in Victorian times. But the current arrangement means that cars speed from traffic light to traffic light or whenever there is a clear space ahead of them. If the traffic lights were replaced by zebra crossings, drivers would not race to beat the lights. Until the streets were reorganised due to the Luas works, cars and buses used to swing from St Stephen’s Green onto Dawson Street as if taking a rally racing corner. If that light were replaced by a zebra crossing, exactly the same volume of traffic per hour would pass through, but at a much calmer pace and without pedestrians being gratuitously interrupted as they went on their ways. The practical consequence of zebra crossings would be a reordering of the hierarchy of Dublin’s streets. The current arrangement of traffic lights and pelican crossings announces that motorists have priority by default, with pedestrians a distant third. It is small comfort to cyclists that they nominally also have priority over pedestrians. 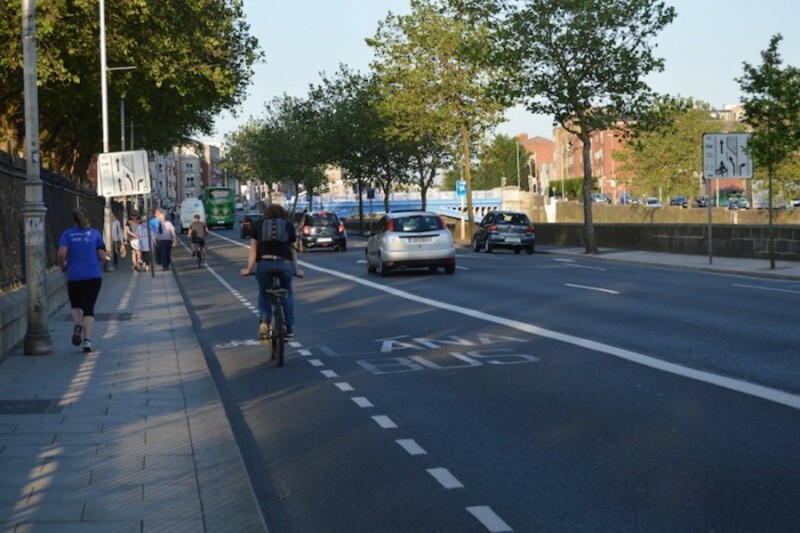 The failings of Dublin’s current road infrastructure for cyclists are too numerous to address here, but a re-prioritisation of pedestrians would greatly improve things for cyclists too. And even the modicum of control offered by the little button on pelican crossings is illusory: in the centre of Dublin, the pedestrian lights go green at timed intervals and are indifferent to the pedestrian’s jabbing finger. The one exception is the pelican crossing outside Leinster House. This shows that our elected leaders, at least, understand the advantages that they choose not to provide to the rest of the population. So the zebra crossing is subversive. By declaring that the car is not king, it creates a fairer system for all, one that allows pedestrians and motorists to go about their business in a much nicer way. At signal-controlled junctions, both motorists and pedestrians wait for the insensible signal to tell them what to do. 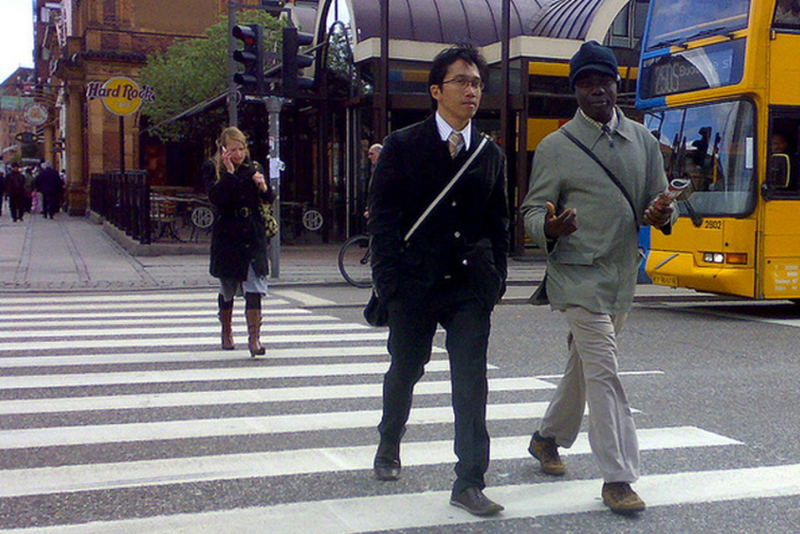 At zebra crossings, there is eye contact and communication between the road users. In Brussels, there is a zebra crossing at almost every junction, and at each of these, hundreds of times every day, drivers yield to pedestrians and each party gives a little wave or nod in acknowledgement of the other’s courtesy. In 2011, an Economist columnist wrote that Brussels’s zebra crossings “seem to have almost no effect on passing motorists”. This isn’t my experience at all: there are as many careless drivers here as anywhere, but it’s much easier to be a pedestrian here than in Dublin. So, why are zebra crossings not used in Dublin? Take note, that this “safety”perspective comes from a spokesman for the motorist lobby. It’s a safe bet that the same ostensible preoccupation with safety has caused them to be removed in Ireland, too. I think this preoccupation, though well-intentioned, rests on a fundamentally pessimistic view of human behaviour. Engineers assume that pedestrians and drivers can’t be trusted to trust each other in the informal give-and-take that a zebra crossing requires, so they design junctions to avoid such interactions. This has a deleterious effect on the way people regard other users of the streets. Motorists and pedestrians operate in their own exclusive sphere and they see each other as competition. Every crossing is a zero-sum game, where every additional second assigned to pedestrians to cross means a second less for cars to zoom through. The pessimism is self-reinforcing. Because drivers and pedestrians never interact except via the chaperone of a traffic light, they never learn to trust each other. This competition is not inevitable. An optimistic approach to urban planning in Dublin would assume that people using different modes of transport can get along just fine in a well-designed environment. The humble zebra crossing applies a simple standard – priority for pedestrians – and removes the need for further rules, because both drivers and pedestrians realise that the city is perfectly, and pleasantly, navigable once the driver’s absolute right of way is curtailed. Zebra crossings don’t have to be any more complicated than a set of painted lines from the most convenient crossing points on either side of a street. But the Irish design manual for roads, which seems to have been largely copy-pasted from the UK equivalent, requires zebra crossings to be flanked by a couple of poles topped by flashing yellow beacons. The Italian Quarter crossing conforms to this standard. The ugly poles add clutter to the street. Zebra crossings consist of nothing more than painted lines in France, Belgium, Switzerland, and many other European countries. Moreover, the flashing yellow beacons add a feeling of danger that undermines the whole point of accommodating more vulnerable road users. The design manual should be changed so that Irish zebra crossings can be provided without these accoutrements. The rules of the road would ideally need to change too. At the moment the Irish Rules of the Road once again ape the British example with a silly set of rules governing zebra crossings. Under these rules, cars only have to yield after the pedestrian once they have moved onto the zebra crossing, and not before. This means, that a car doesn’t have to stop for a pedestrian who is standing by a crossing. 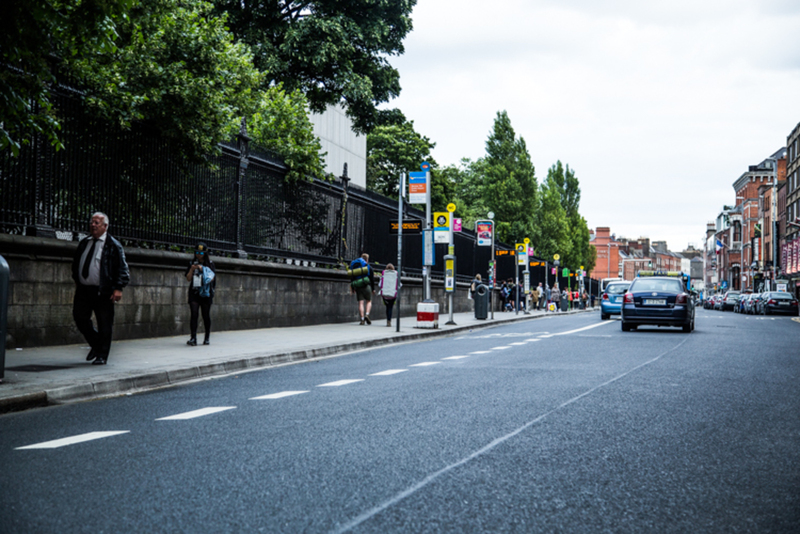 Pedestrians will only dare to cross the road at a zebra crossing when there is a gap in the traffic, and cars will treat crossings as little more of an obligation to yield than the vaguely raised grade that you find today at certain crossing points in Dublin. 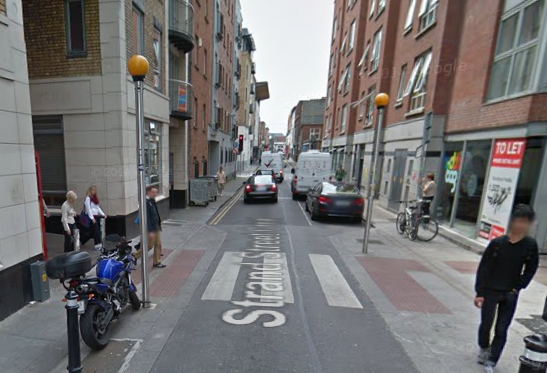 Even with the current imperfect rules, zebra crossings would be a vast improvement on Dublin’s current streetscape. But if our planners wanted to be truly progressive, they would take the best practices of zebra crossings from Europe and the United States and apply them to the streets of Dublin,lobbying for changes in the Irish design manual and the rules of the road, if necessary. I would like to see priority given to pedestrians in Dublin city centre, however it’s done. I like zebra crossings too, but I’m no expert on implementation of them. As for roundabouts, there’s one, with beacons, on the exit from the car park of the Tesco in the Dundrum Town Centre. On one approach it’s on the wrong side of a blind corner, and on the other it’s on the exit of a big roundabout. So a useless zebra crossing, unfortunately, especially because of the blind approach. There are alternating bands of light and dark on the roadway at junctions inside East Point business park, but management emailed around a few years ago when I worked there to make sure everyone understood that these were not intended to give pedestrians priority They were just decorative. Unlikely to happen, I think, due to the “perceived” excessive risk of accidents. I’m with Thomas on this issue! It needs a combination of recognised slowing down by traffic, and the prioritising of pedestrian movement! Lets hope for a revival of the Zebra Crossing! @Austin — that’s exactly the point that I wanted to challenge in this article. As you say, there is a “perception” of increased safety from signalled lights and other traffic design features that keep drivers and pedestrians separate at all times. But it’s only a perception, and we’d have more safety if we had an ethic of cooperation and shared space in the city centre. The current arrangement, where drivers are told by the street design that they have absolute priority on the streets except for micro-segments of time grudgingly given to pedestrians at traffic lights, creates a more dangerous atmosphere all round. @Dermot — thanks for pointing out another sighting of this rare beast. Sounds like the one in Dundrum has the usual problems of poor design. I lived in Glasgow for a long time and I’m fairly sure there is 1 in the city, in Govanhill. Drivers don’t know what to do with it. someone one said that its only for kids going to school and its open season after that. Is it an offence to driver through one? It should be. If they can implement a very profitable fining system for cyclists, they can well do it to drivers which would fairly quickly put zebra crossings back into their minds. 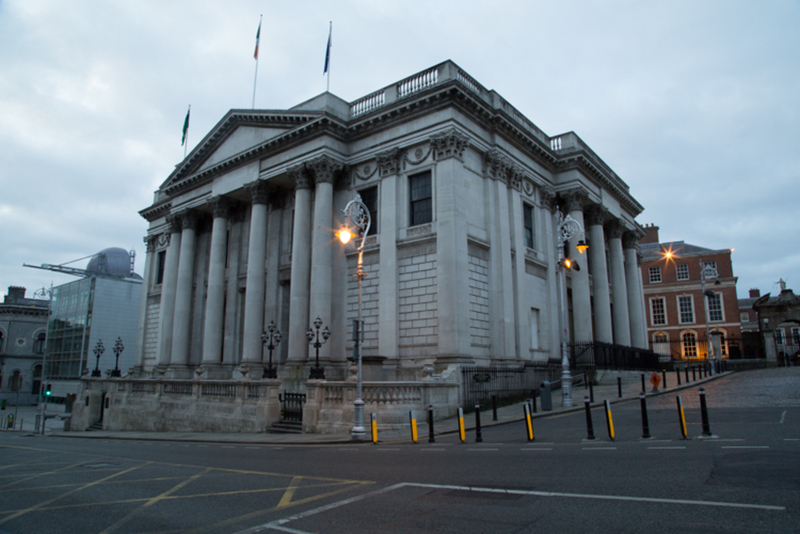 Are there any DCC councillors willing to take up the fight? Ciaran Cuff maybe? It never ceases to amaze me why there or not more zebra crossings in Ireland. I’m live near Howth village Co Dublin where the Harbour Rd has about four of them and a fifth was installed recently at the end of the Main St. I think they are very effective. (Though flngal co council never seem to change the bulbs). I know of no other zebra crossings anywhere else in Dublin.